24 975 487 visitors here since April 1997. 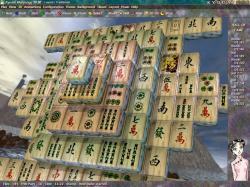 The best Mahjongg Solitaire game for Windows! « Loading Kyodai Mahjongg for the first time is a revelation in how Mahjongg Solitaire games should be made. From the moment the soothing guitar music washes over you to your first look at the feature-packed but well organized interface, it's apparent that Kyodai Mahjongg is about escaping the real world and immersing yourself in a simple game. In development since 1997, Kyodai Mahjongg has more than enough content to please the hungriest appetites, including eight fully realized Solitaire games, online multiplayer modes and dozens of tilesets and layouts. Kyodai Mahjongg is also a tweaker's dream, as the interface contains a wealth of visual and audio options, including the ability to switch between 2D and 3D graphics on the fly. Solitaires is a very large collection of solitaire card games. 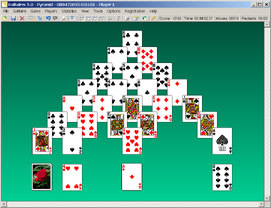 The current version (7.0) is made up of 385 different solitaires, including all the traditional ones (as Baker's Dozen, Canfield, Fan, Klondike, Montecarlo, Poker Solitaire, Spider, Pyramid, and so on) and many that appear for the first time in a computer game (as Babette, Backbone, Fission, Flip Flop, Great Herring-bone, Hill of Difficulty, Moojub, Pendulum, Robin Post, Striptease and so on). It offers 385 games for $19.95, and as for Kyodai Mahjongg, free updates forever, which is to say, a bargain! VISIT THE SOLITAIRES WEBSITE NOW! Credits. Page built in 0.0722s (MySQL - 0.0124s).